Uneven heat can make cooking salmon difficult for even experienced cooks. 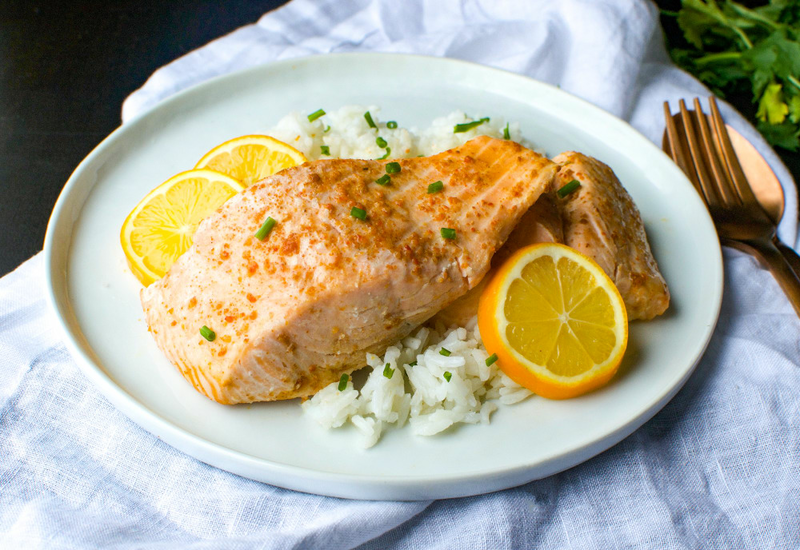 This pressure cooker version creates moist and tender salmon in just 15 minutes. While the salmon is in the MultiPot, you can whip up a quick salad or side dish and dinner is served! You will have a quick and easy main with less than 5 ingredients. Plus, this recipe is Paleo-friendly and suitable for the Whole30 diet. If you want to incorporate more omega-3's into your diet, Pressure Cooker Salmon is they way to go! Ask your fishmonger for center-cut salmon filets of uniform thickness so it cooks evenly in the pressure cooker. It is up to you whether you prefer farm-raised or wild-caught salmon. Wild salmon has a more vibrant pink-red color and a more intense, and complex flavor than farm-raised. Per Serving: 297 calories; 18g fat; 1.4g carbohydrates; 31g protein; 89mg cholesterol; 232mg sodium. I was tempted to wrap the salmon in a parchment paper envelope. I was afraid I'd lose too much moisture and end up with cat food. Should never have doubted the power of the multipot! Great texture. Not overcooked in the least. Even my elder son, who generally eats salmon only as sushi, was okay with it (that's a big deal, to me!). I seasoned the fish with Tom Douglas' "rub with love" salmon rub. You can find recipes for it if your grocery doesn't carry it. Best fish seasoning I've ever had. This was my first time making salmon in the pressure cooker, and I must say, I am impressed! The cooking time is little to nothing (I actually thought I had read it wrong). It cooks in mere minutes, and doesn't fall apart. Delicious! This was incredibly easy to make. I prefer this method over pan frying, for sure. I can't believe it only take 3 minutes to cook. Perfect recipe! I was so surprised at how this salmon turned out. I didn't even need paprika, I just used lemon juice, salt, and pepper. Using the pressure cooker doesn't replace that crisp, flaky texture on the outside of the salmon, but for a steamed version it was really good. I didn't like the paprika on my salmon, but this is a great recipe in terms of cooking times, etc. The salmon was cooked to perfection. Really pleased with the way it turned out. Next time I will just use a simple salt and pepper seasoning with lemon juice. This was my first time using the MultiPot and I was amazed at how tender and flavorful the salmon was after only 3 minutes. Great recipe. Looking forward to the next meal. My husband said it was the best salmon ever. Simple and delicious, use whatever seasoning you like! The salmon ended up wonderful but needed to cook longer. I originally set the pressure cooker for 3 min and after it was done the salmon was raw in the center. It was a thick fillet. I put it in for 4 more minutes and it was perfect.